When I think of brunch cocktails, I often think of sweet drinks like Mimosas or Bellinis, but I’ve had nothing but Bloody Mary’s no the brain for over a month. After tinkering and tweaking this recipe again and again, I’ve found the ultimate Bloody Mary mix recipe. Pair this mix with some out-of-this-world garnishes and an unexpected liquor and you will have yourself an amazing Bloody Mary Bar. This post has been a long time in the making. My husband and I have been talking Bloody Mary’s – with all of the possible garnishes – for months. 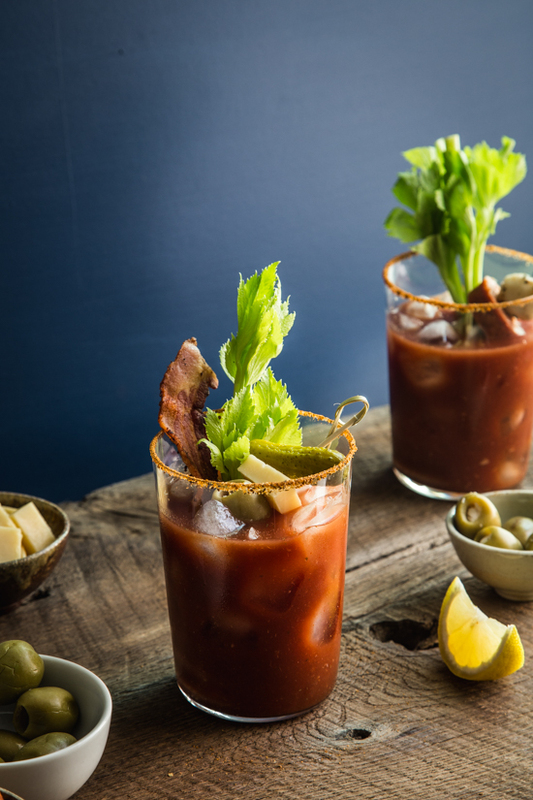 It’s taken quite awhile to find a Bloody Mary base recipe that has lived up to our expectations, but we’ve finally landed on this amazingly savory, spicy and smokey mix. If I’m going to go back to the beginning stages of this drink, I would need to go all the way back to last summer when we traveled to Arizona. While there, we ordered a drink that was made with Mezcal (sometimes seen as Mescal) which is actually a Mexican liquor in the tequila family. While I’m not typically a tequila fan, this Mezcal blew my mind. It is an incredibly smokey flavored alcohol that is reminiscent of bacon. Well, maybe not bacon bacon, but it brings to mind some seriously savory smokiness. Ss soon as we sipped it, we both thought it would be killer in a Bloody Mary. Zoom forward to this summer. After an entire year went by without having a chance to try out our Mezcal Bloody Mary, we went out to brunch one Sunday only to be confronted with a Bloody Mary on the menu. We ordered one and it was less than impressive. It lacked originality, flavor and most importantly: garnishes. An anemic piece of celery and one lone olive were all that graced this lack-luster drink. After this experience we got back to planning out our ultimate Bloody Mary and all of the amazing garnishes we could include. 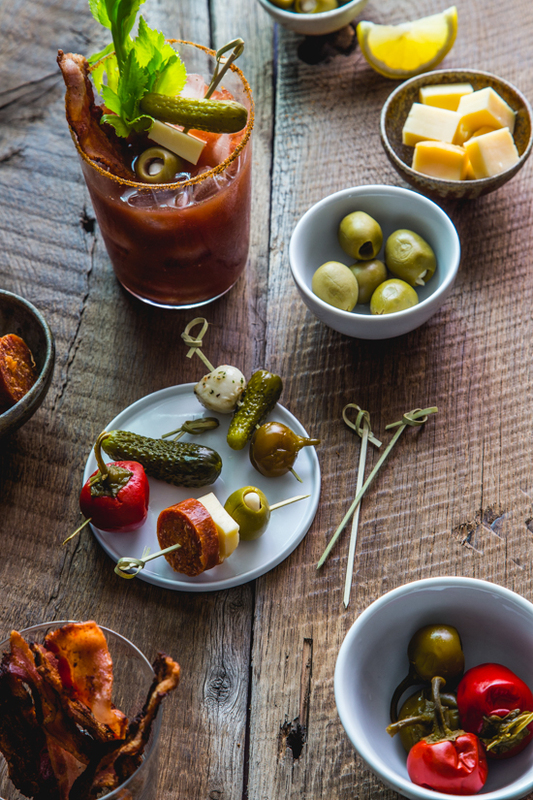 We wanted to build a Bloody Mary bar worthy of a party. So then we were back to the problem of developing the perfect base recipe that could hold a candle to all of these awesome little bites. 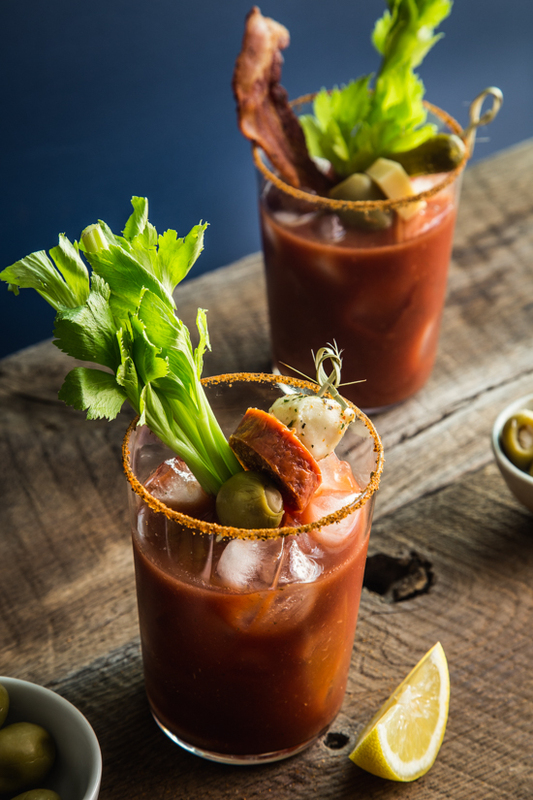 After much research, we came across this Elixir Bloody Mary recipe from Liquor.com. The Old Bay rim sealed the deal for me. We changed it up a bit with the addition of smoked salt and celery seed, but the biggest change we made was swapping the vodka for Mezcal. The amount of smokey, chili flavor that the Mezcal brings to the party is incredible. I will never make a Bloody Mary with vodka again. And that’s saying something because I’m a vodka kind of girl. 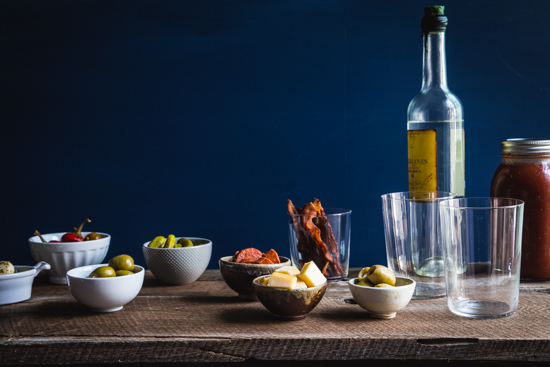 Lets not forget the amazing list of garnishes: pepperoni, thick cut bacon, smoked gouda, sweet cherry peppers, baby dill pickles, blue cheese stuffed olives, garlic stuffed olives and marinated mozzarella. Oh, and you can’t forget the lemon wedges and celery. You need some big, beautiful celery stalks for these drinks. Nothing wimpy and leafless is allowed. I love how this drink turned into a snack and a cocktail all in one. I loaded up my drink with all sorts of goodies and had a blast drinking and nibbling my way to the bottom of the glass. It was a complete sensory experience. So, next time you’re looking to put out a great cocktail spread you’ve got to try this Bloody Mary Bar. Your friends will love you for it! Sprinkle Old Bay seasoning on a plate. Rub glasses with lemon wedge and dip rim of glass into Old Bay seasoning to rim. Set aside. In a quart size mason jar, add the remaining ingredients except for the Mezcal and garnishes. Replace lid and shake. Fill a shaker with ice and pour about 6 ounces of mix and 2 ounces of Mezcal over the ice. Shake gently and pour unstrained into rimmed glass. Repeat with remaining cocktails. Garnish with celery, lemon wedge and remaining garnishes of your choice. Serve immediately and Enjoy! 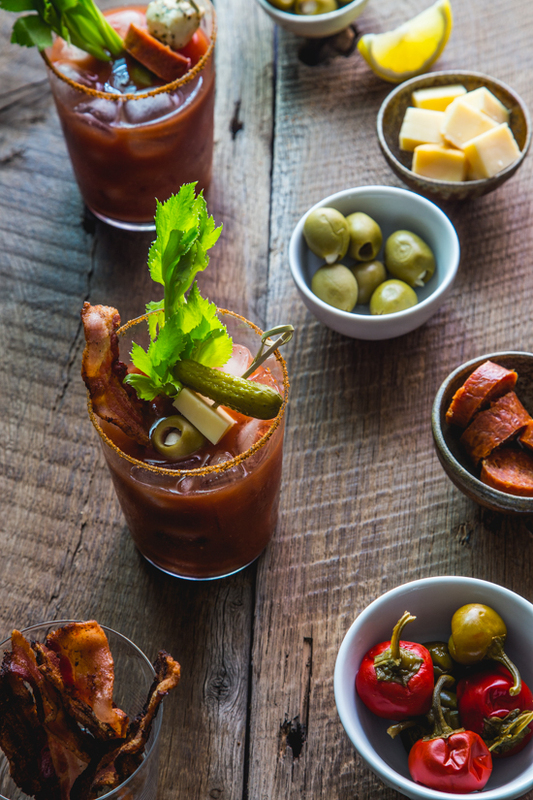 Serve Bloody Mary's with a selection of garnishes such as crispy cooked thick cut bacon, pepperoni chunks, smoked gouda, mini hot dill pickles. garlic stuffed olives, blue cheese stuffed olives and marinated mozzarella. 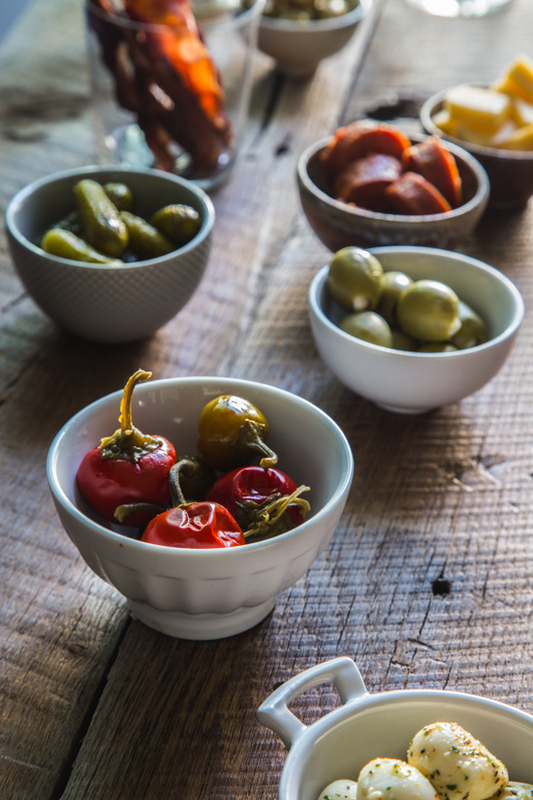 Place cups of garnish picks on the table so that guests can assemble their garnishes of choice. You could also prepare the picks ahead of time and create a variety of pre assembled garnish picks for your guests to choose from. Mix can be made ahead of time and store in the refrigerator for up to 3 days. I can’t wait to show this to my sister. She will fall over in a dead faint since she is the queen of snazzing up a Bloody Mary. First I’ll have to pin some of your gorgeous photos though! Stunning! I love this. I only tried my first bloody mary last year (! I know!) but I became a devotee. Thank you for the inspiration! You’re so welcome! Thanks so much for stopping by! I have never seen bacon in a bloody mary before.. such a good idea though! 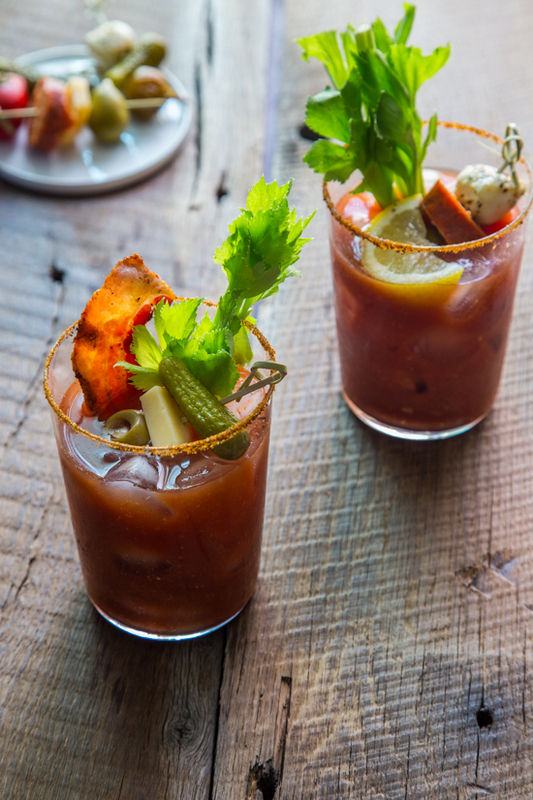 These bloody mary’s look totally delicious, definitely wish I could devour one right now! There is so much genius here! First of all, I’ve never used Old Bay for the rims. I always use celery salt, but I can see that Old Bay would have soooo much flavour. And hello, that Elixer juice concoction you’ve got going on with pickle juice and olive brine? Damn! That’s just not even fair! 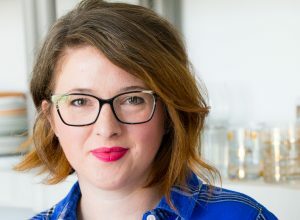 Great fixing ideas too – smoked Gouda is my favourite! Thanks for such an awesome post! Hi , Im interested in using one of these shots for my companies digital social content, are any images for sale or do you issue usage rights? I LOVE a Bloody Mary, and like you, have spent years perfecting my recipe. I already use most of your suggestions, but cannot trade out the vodka for the tequila. Have you ever tried the juice from Smokra (smoked, pickled okra available at Whole Foods)? I agree that smokey flavor adds another dimension. My other addition is a little balsamic vinegar. One of my favorite garnishes is something called a Tomolive which are pickled green grape tomatoes. I use the juice as part of my elixir. The rest of my recipe is exactly like yours. Loved this post and now I need to read the rest! Woah!! I need to find this Smokra that you speak of 🙂 It sounds awesome! Bloody Mary’s are the best, aren’t they? Thanks so much for stopping by, Margie!